Speed, torque, power and voltage are all important considerations when choosing a motor. In this two-part blog, we’ll dive into the specifics of motor speeds. In Part 1, we’ll discuss how speed differs between motor types, and in Part 2, we’ll look at when to consider adding a gearbox to the application. 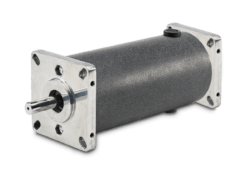 AC motors are unique because they are built to run at specific speeds regardless of their design or manufacturer. The speed of an AC motor is dependent on the number of poles it has and the line frequency of the power supply, not on it’s voltage. Common AC motor units are constructed with either two or four poles. A magnetic field is created in the stator poles that induces resulting magnetic fields in the rotor which follow the frequency of the changing magnetic field in the stator. Two pole AC motors operating at 60 Hz will always run at approximately 3600 rpm, and four pole AC motors will have speeds around 1800 rpm. Example 120 x 60 hertz / 4 poles = 1,800 rpm. A control can be used to alter the speed of a three phase AC motor by increasing or decreasing the frequency that is sent to the motor, causing it to speed up or slow down. Additionally, many AC controls have a single phase input so this allows you to run 3 phase motors in facilities that don’t have 3 phase power available. However, this ability to alter the speed isn’t typically the case for single phase AC motors. These motors are plugged directly into a standard wall outlet and operate using the set frequency available. An exception to this rule of thumb would be a ceiling fan that runs using single phase AC motor, but has three different speed settings. Although permanent magnet DC motors are also built with poles, these poles don’t impact speed like with AC motors because there are several other factors in play with DC motors. The number of wire turns in an armature, the operating voltage of the motor, and the strength of the magnets all affect motor speed. If a DC motor is running on a 12 V battery, that is the maximum voltage available to the unit and the motor will only be able to perform at a speed rated for 12 V. If the battery is low and supplying less voltage, the speed will decrease accordingly. Now, if you connect that same 12 VDC motor into a 24 VDC power source, your speed typically doubles. Keep in mind, operating the motor at twice the speed at the same load/torque point will cause the motor to work harder, creating additional heat that could cause premature motor failure over time. As with three phase AC and Brushless DC motors, controls can be used with DC motors. DC controls adjust speed by varying the voltage sent to the motor (this differs from AC motor controls which adjust the line frequency to the motor). 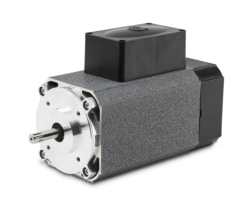 Narrow your search by selecting motor type, gearbox, voltage, and phase options for your desired motor. Dark gray represents available options. Light gray represents options not available with previously selected criteria. Select a dominant variable: choose one of the three parameters to narrow your search. The selected variable determines which slider bar you will be able to manually move. Use the slider corresponding to your dominant variable to further narrow your motor selection. The other sliders will automatically move to show available ranges based on the range of your selected variable. Results will upload as your search criteria changes. If you have any questions regarding your results or how to use the search tool, you can chat with us using the green tab on the left-hand side of your screen. Note: Groschopp Universal motors are custom built to fit your application so no additional options are available to narrow the search. Selecting the Universal motor type will prompt a message taking you to the Universal product page. One of our team members would be happy to help. Contact us at 800-829-4135 or by email at sales@groschopp.com. You can also chat with us using the green tab on the left side of your screen. Groschopp Universal motors are custom built to fit your application so no additional options are available to narrow the search. Standard frame sizes and motor features can be found on the Universal page.